Welcome and thank you for worshipping with the All Saints’ family today! There is fellowship hour after the service. Please join us for some refreshments. We would love to introduce ourselves, greet you, and answer any questions you might have. Betty Gear; Angel Gonzales; Mario Petralia; Nathan, Morgan; Ancel y Carmen; Lupita Diaz; Catalea; Jose Lopez; Jeanette Durfee; Bill B; Silvia Jacobo; Ramon Torrez; Joan Erickson; Javier Cervantes; Jean; Rocky; Joyce Yin; Kevin Danna; Cindy Morales; Margot Palacios; Juan Carlos Ramirez; Max Parra; George Jacques; Marisol; Letty Reyes Mendoza; Yvette Laporte Hernandez; Christopher Craig; Fabrizzio Landivar; Tania Palacios; Jan Robertson; Monica Tsung Thluai Htun; Ivan Palacios; Gloria Palacios; Adriana Salas; Pablo Lozano; Sandra Ahn; Leticia Medina; Candy; Juan Vega; Esther Machaca Vargas; Kai Scott; Anne Marie Moos; Kailani Gaspar; Hermelinda Collazo; Ortiz Family; Raul Coimbra; Mary Lou Clayton; Lilia Martinez; Tom Dayton; Diane Torren; Herb & Lois Campbell; Joyce Ewald; Jim and Cheryl Burr; Ethan; Toby; Josefa Sosa; Jim Brown; Sally Hanley; Cheryl Berger; Sarah Terrill; Teresa Riehl Morris; Walter Fuller; Billy Martin; Elizabeth Rinnander; Matt Storch; Danny Torrez; Kelly Maple; Kier Stumpf; Tim Noack; Gilberto Valencia; Wah Davis; Rachel Hernandez; Karina Gomez; Ana Alcocer; Juan José Sarti; Juan Carlos Tuero; Rosario de Dios; Kurt Coffed; Millie Whiting; Mrs. Khin; Tha Htin. We pray for the repose of the soul of Mary Pagels and for her family and friends. We pray for the repose of the soul of Barbara Roberts and for her family and friends. We pray for the repose of the soul of Caroline Danna and for her family and friends. We pray for the repose of the soul of Jose Bernal and for his family and friends. Praying for those discerning ministry in the church: KC; Bill; Cody. Praying for Diocesan Reconciliation Process. We pray for those affected by the wildfires and for safety for those fighting the fires. Our Prayer List is updated each week. Please let us know whom you would like to include on the list. Prayer requests may be put in the offering plate on Sunday. Names will be on the prayer list for one month, unless you request otherwise. Please call to remove names if prayers have been answered. If something comes up during the week and you want someone added or removed, please contact the office by Wednesday at 1pm. Greetings! And welcome to All Saints Church. Vestry meeting: today in the office at 1:45pm. Cursillo Announcement: PLEASE JOIN US for a GRAND ULTREYA Cursillo: “It’s More than Just a Weekend!” AUGUST 25, 2018 8:30 A.M. – 1:30 P.M. WHERE: Cathedral Center of St. Paul, 840 Echo Park Ave, Los Angeles CA 90026. WHAT: Workshops; Music; Group Reunion; Inspirational Speaker; Grand Ultreya. Continental Breakfast and Full Lunch Included; Refreshments all day. Children Welcome, No Day Care Provided. 8:30 A.M. Breakfast & Fellowship. 9:00 A.M. Program. TO REGISTER: Send an email to Amy Clayton (amy.jpc@gmail.com) or a text to Gabina Altamirano (714) 383-2975). Include your name, parish, and number of people attending. TO PAY: Pay at the door. Ventura County Agency on Aging Classes available soon: 10/2/18-11/20/18, Tuesdays 2-4pm in the parish hall – Fall Prevention “Un asunto de equilibrio (in Spanish). Diabetes Education Empowerment Program: 9/13/18-10/18/18 Thursdays 2-4pm. Both led by Dina U. Ontiveras from VCAAA, number: 805-477-7343. Save the date: Church retreat weekend at Mount Calvary Monastery is Sept 7-9 of this year. Cost will be approximately 260 and we can provide partial scholarships if needed. Study topic will be civil conversations: how faith can interact with current political realities for real conversations about the things that matter. Next BILINGUAL service will be at 9:30am Sunday September 16 for the Fiestas Patrias celebration- stay after to watch the parade! No 11:15 service that day, just one bilingual service at 9:30. Laundry love: our Daughters of the King group will be collecting quarters and small packages of laundry detergent as well as washcloths to share with those in need in our community so that they can do a load of laundry. Hospitality note for the 9:15am service: Thank you to all who generously give of your time and talents (and treasure!) to provide such lovely coffee hours as we enjoy. If you are interested in joining the team for the future, please contact Dale Belcher at (805) 984-7624 and provide her your email or preferred method of contact. Deep stretches and breaths: Wednesday Yoga. We have resumed our Wednesday community yoga classes. Come between 6:15 pm and 6:30pm for a 6:30pm start time, after the 5:00 p.m. Healing Eucharist. Suggested donation is $5-10 or you may give more or less, depending on your resources. Also on Wednesdays: we continue to do Evening Prayer, Eucharist and healing prayer along with a Bible Study on the book of Acts at 5pm every Wednesday in the chapel. Come join! “Like” us on Facebook! 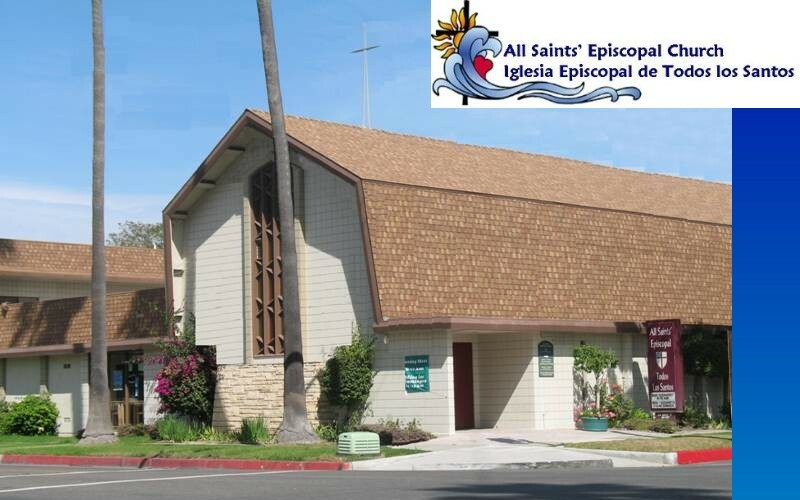 All Saints /Todos los Santos Episcopal Church has a Facebook page. Please “Like” us to keep up to date with what is going on! You can also help us spread the word about All Saints by reviewing us on “Yelp.” You can also follow Rev. Melissa on Twitter at: @revmelissal. Community Notices – Please see the notice board in the Parish Hall for more information. The Episcopal News Weekly: Please take one for your home. Godspell (Bishop’s Concert Fundraiser): presentations at Coburn School in Los Angeles on Saturday 9/8 at 7pm and Sunday 9/9 at Trinity Episcopal Church, Santa Barbara at 6pm, tix at www.bishopsconcert.org. Additional Vestry Members: Ramiro Medina, Margot Palacios, Gladis Lopez. Reid Ripley, Johanna Fredrics, Lupe Vega. 12 Noon Thursday Midweek Service & Meditation Fri.1-4PM. Please call for appointment. Youth Group meets each Friday 5PM-7PM Monday is Sabbath day for Pastor.